G Larry Warford and T Ryan Ramczyk vs. DIs Kenny Clark and Dean Lowry — Larry Warford and Ryan Ramczyk make up the right side of the Saints offensive line, and both have performed decently overall so far in 2017. Warford’s earned a 69.2 overall grade, and his pass-blocking grade grade of 81.1, tied for 12th among eligible guards, contrasts with his 44.0 run-blocking grade, 48th among guards. Ramczyk’s at 74.4 overall, with a 73.6 pass-blocking grade and and an equally strong 75.7 run-blocking grade. On defense, Kenny Clark and Dean Lowry man the defensive left interior and left end respectively. Clark’s 87.3 run-defense grade is seventh among eligible defensive tackles, and his 9.6 run-stop percentage is 17th among 58 defensive tackles with at least 79 run snaps. Lowry’s had a poor start to the season, reflected in his 47.1 overall grade. He has yet to get a sack or hit on an opposing quarterback, and his 5.0 pass-rushing productivity rating is tied for 40th out of 56 defensive tackles with at least 99 pass-rushing snaps. 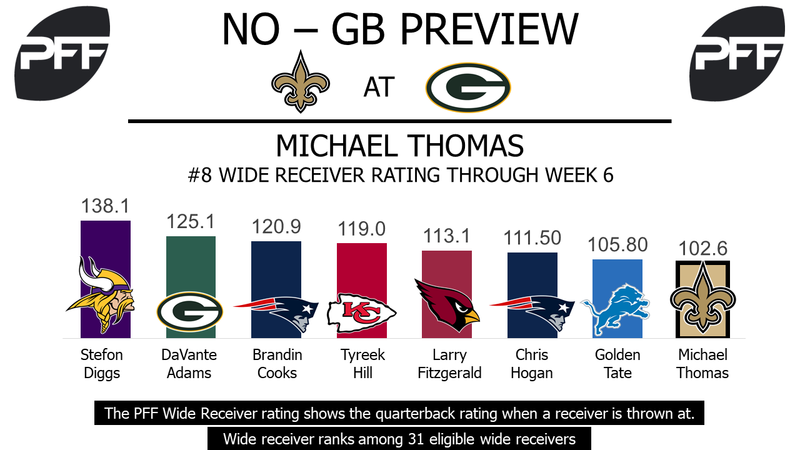 WR Michael Thomas vs. CB Damarious Randall — Michael Thomas had a rough outing in Week 6, grading out to a 43.9 overall for the game, but he was up against an impressive coverage performance of Darius Slay, who earned an 82.6 overall game grade. He’ll enter this game against the Packers with what projects to be a far easier matchup against cornerback Damarious Randall. Randall’s 40.6 overall grade is 106th out of 113 wide receivers with at lest 107 snaps. His 1.41 yards allowed per coverage snap is 56th out of 72 cornerbacks to play at least 134 snaps in coverage. RB Mark Ingram vs. Edge Clay Matthews — In last week’s Saints game preview, I looked at Alvin Kamara’s matchup in light of Adrian Peterson’s departure. Mark Ingram is also a beneficiary, as he and Kamara now form a two-man backfield. Ingram’s coming off his highest graded game of the season at 76.0 overall, and will be matched up regularly with edge defender Clay Matthews. Matthews boasts a 85.9 run-defense grade, ninth among 101 eligible edge defenders. He’s missed just one tackle on 132 snaps against the run to go along with 12 tackles and eight assists, for a tackle efficiency number of 13.0 that’s tied for 26th among 64 edge defenders with at least 23 run snaps. T Bryan Bulaga vs. Edge Cameron Jordan – Bulaga is expected to start against the Saints after leaving this past Sunday’s matchup against Minnesota with a concussion. The right tackle has played only one full game for the Packers this season. He’s allowed nine total pressures, including a sack, in his 86 pass-block snaps this season. His pass-blocking efficiency of 91.9 is the lowest among the 10 Packers offensive linemen that have pass blocked for at least 37 snaps. This week, he’s charged with limiting Jordan, who’s PFF’s top-rated edge defender at 92.7. His pass-rushing productivity of 11.8 ranks 12th among edge defenders, and his 26 forced pressures ranks eighth. 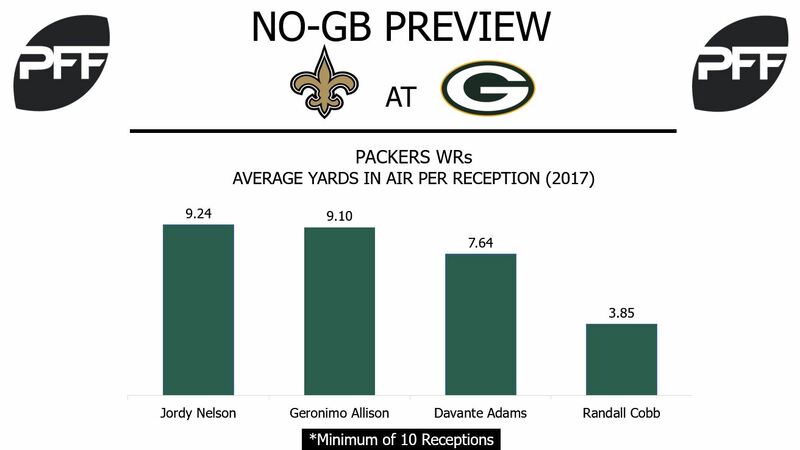 WR Randall Cobb vs. S Kenny Vaccaro – With Brett Hudley stepping in for Aaron Rodgers at quarterback, efficiency in the short passing game could be vital to the Packers’ offensive success Sunday. Against the Vikings, 15 of Hundley’s 18 completions were made less than nine yards downfield. Passes caught by Cobb this season have traveled an average of 3.85 yards through the air. Cobb has inflicted most of his damage out of the slot, where he’s run 84.1 percent of his routes. He averages 1.21 receiving yards per route run out of the slot, which ranks 32nd out of 55 qualified receivers. Vaccaro is New Orleans primary slot cornerback. When in slot coverage, he’s allowed 14 completions on 21 passes for 174 yards, one touchdown and one interception. TE Martellus Bennett vs. S Vonn Bell – Bennett enters Week 7 ranked 62nd among tight ends with a PFF overall grade of 41.7. He’s averaging 1.10 receiving yards per route run, which ranks 31st for his position. A majority of his production has come out of the slot, where he’s caught 13 of his 18 targets for 137 yards. He will likely often be guarded by Bell on Sunday. Bell has allowed eight catches on 13 passes thrown into his coverage for 71 yards. His PFF coverage grade of 45 ranks 70th among safeties.